Doing business for over 30 years for a reason!! Imagine a space in your home where you could enjoy the beauty of the outdoors from the comfort of your home. Architectural Glass can create that special space economically and quickly, whether it is a sunroom, glass or screen enclosures, an EZE-Breeze enclosure or new energy efficient replacement windows. For over 30 years, discriminating homeowners have looked to Architectural Glass for their sunroom, EZE Breeze, DIY EZE Breeze, conservatory, patio sunroom, solarium, replacement windows and doors, screen porch, and porch conversion needs. We are proud to be one of the oldest sunroom and porch conversion companies in South Carolina. Over the years, many things have changed, but one thing has not – our dedication to providing each and every customer a product that suits their needs and design. We are one of the ONLY companies that have been in business for over 30 years and there IS a reason for that!!! 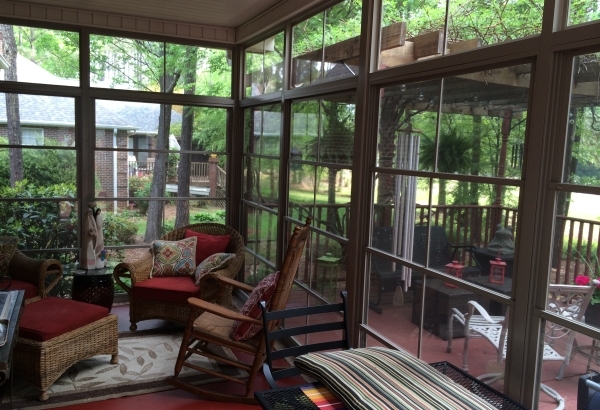 Let us convert your standard screened in porch to a more useable space with windows or EZE Breeze windows. We hope our website provides you with ideas and designs to help you create that special space you desire for your home. As a company, we are here to help you with this design as well, and welcome any questions or comments. Of course you can email any pictures of your home or questions you may have to us at [email protected]. We offer free in home estimates and will be there every step of the way even years later if you ever need service or have questions. We service South Carolina, North Carolina, and Georgia and as always we take pride in every job we do and are very proud of our excellent reputation and customer service that we offer.